Anthony Davis - The NBA's "Next Big Thing"! 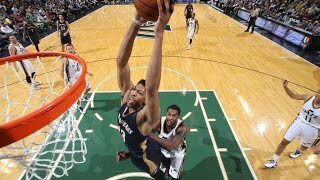 Check out highlights from New Orleans Pelicans big man Anthony Davis as he shines in the 2014-15 season! Anthony Davis -- The NBA's "Next Big Thing"! Check out highlights from New Orleans Pelicans big man Anthony Davis as he shines in the 2014-15 season! Anthony Davis – The NBA’s “Next Big Thing”! The Utah Jazz say guard Alec Burks will miss the rest of the season after surgery on his injured left shoulder. Anthony Davis is the NBA's 'Next Big Thing'! NBA Motivation - What's Your Excuse ?